In the lead up to the release of my first novel, I thought I’d revisit five great spy movies that have influenced my writing. Be warned, there are some spoilers to be found. 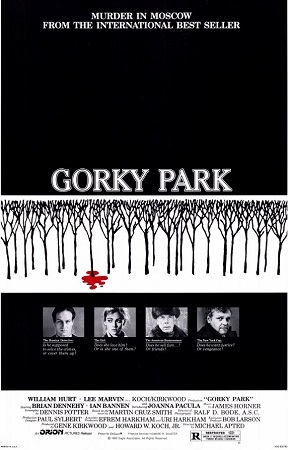 Gorky Park (1983) One of the first spy thrillers I read as a teenager was Martin Cruz Smith’s Gorky Park. I was drawn to this book because I thoroughly enjoyed the movie. I was immediately impressed by the clever plot line, tense writing and engaging characters, but mostly because I felt I was actually transport into Soviet Era Russia. Years later as an adult I realised that this was the first time that a Cold War thriller written by an American author had a Russian agent as the hero. Militia investigator Arkady Renko goes up against a corrupt and calculating American businessman, Jack Osborne. The tradition at the time, and even now, is Russians as bad guys. Not in Gorky Park. The movie, like the book, commences with three bodies found in the titular Gorky Park, frozen with their faces and fingers carved off obscuring their identities. William Hurt was perfect as the troubled Renko. He carefully navigates his way through the murder investigation because the evidence he uncovers might point to the KGB, who are responsible for half the murders in Moscow. Renko waits for the KGB to take the case from him, but they never do, and soon Renko senses that he is being set up as a fall guy for murder with international implications. The film cleverly depicts the totalitarian state of 1980s Russia with subtle dialogue about characters ‘not being long for this world’, heightened paranoia with most scenes featuring characters intently watching someone else, and a grey starkness to almost every scene. Martin Cruz Smith is a fascinating author. His father was a white jazz musician and his mother a Pueblo Indian jazz singer. This background comes through in many of his earlier novels, such as Nightwing and Stallion Gate which feature American Indians as protagonists caught up in covert operations, often without any ability to influence outcomes because of their second class status. These themes are also covered in Gorky Park. The novel, and its many sequels such as Polar Star and Red Square, featured noble characters caught up in disparaging events beyond their control. I was struck with the idea that he Arkady Renko novels would make a fascinating television series. Perhaps with Richard Armitage as the titular character, covering the political history of Russia from the 1980s to today. 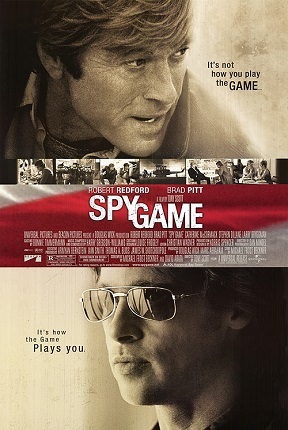 Spy Game (2001) Directed by Tony Scott, Spy Game plays like a historical documentary of the CIA between the 1970s to the early 1990s, covering topical conflicts such as the Vietnam War, the War of the Camps in Beirut, the Cold War in Berlin, and the rise of China as a superpower. The movie centres around three characters, CIA agent Tom Bishop (Brad Pitt), reformed terrorist Elizabeth Hadley (Catherine McCormack), with the standout performance is by Robert Redford as Nathan Muir, an aging mid-level case officer for the Central Intelligence Agency. What struck me about this film was how the dangerous people in the world of espionage are not those with the biggest muscles or largest arsenal of weapons, but those who know how to play any situation to their advantage. One of the screenwriters, Michael Frost Beckner, went on to create the television series, The Agency, which looks at the inner workings of the CIA, with similar themes to Spy Game. The Bourne Identity (2002) The United States never had a strong spy franchise until Matt Damon became Jason Bourne in the rather clever, pacey and very human The Bourne Identity. If you put America’s top fictional spies — Jack Ryan (The Hunt for Red October and Clear and Present Danger), Ethan Hunt (Mission Impossible) and Bourne — in a movie together and faced them off against each other, my money would be on Bourne. It’s a no brainer really. The movie opens when CIA assassin Jason Bourne is shot in the back after a failed mission in the Mediterranean Sea to a kill an African despot on his private yacht, although not all this is clear at first. Saved by French fisherman, Bourne finds he has amnesia hence his lost ‘identity’. As he begins to remember who he is, he realises he doesn’t want to return to his former life as a killer, but the CIA have other ideas. 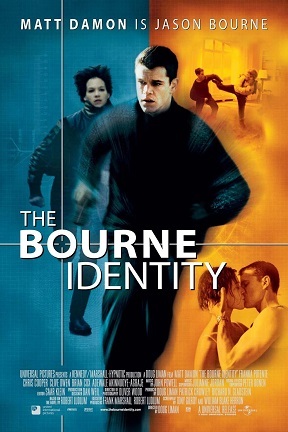 Bourne becomes a man on the run, who uses his skills and training as a special forces soldier to stay one step ahead of his former employers. The Bourne Identity was the movie that forced the James Bond films grow up, ultimately leading to the talented but underused Pierce Brosnan being dropped as 007 after the over-the-top Die Another Day, ultimately replaced by Daniel Craig in the superb Casino Royale. Bourne was real and gritty. At first I didn’t like The Bourne Identity because the plot diverges quickly from the Robert Ludlum novel it was based on. On a second viewing, I saw that it really captured the essence of Ludlum’s themes and narrative. The movie series was excellent until The Bourne Legacy when Jeremy Renner replaced Bourne as CIA agent Aaron Cross. The change in character wasn’t what ruined the series, it was the repetition of the plot lines and the over the top secret organisation within a secret organisation within another secret organisation plotlines that made no sense. While The Bourne Supremacy has some of the best action sequences (such as the car chase in the tunnels in Moscow), I put The Bourne Identity at the top of the list predominately because of the relationship between Bourne and Marie Helena Kreutz, the German drifter who teams up with Bourne played by the talented Franka Potente. A shame Marie had to die in the second movie, without her the series was never the same. 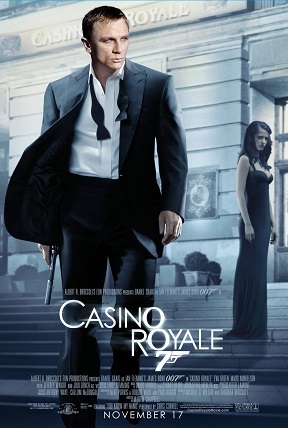 Casino Royale (2006) James Bond had to make the list, and Casino Royale is the best of a rather impressive series, with the Daniel Craig era films being the best of the 23 films thus far. I favour this movie over all others because it has the best of everything, even after repeat viewing. Best Bond (Daniel Craig), best Bond Girl (Eva Green as Vesper Lynd), best action sequence (construction site chase in Madagascar), best story (thanks to the talents of Neal Purvis and Robert Wade who really know their Bond lore and their commitment to staying faithful to the original novels) and best theme song (“You Know my Name” by Chris Cornell). The movie was a reboot of the series commencing with Bond being promoted to Double-O status. Soon afterwards he makes several mistakes in the field but he quickly learns what it really means to have a Licence to Kill. Bond tracks-bomb makers and terrorists in Africa and the Caribbean before attempting to bankrupt a terrorist bankroller, Le Chiffre, in a high stakes poker game in Europe. Needless to say there is plenty of action, torture, creative deaths and a romance, and this is only the second time that Bond falls in love. Daniel Craig is perfect as Bond, really capturing the elements of Ian Fleming’s character that Timothy Dalton came close to achieving but never quite got there because he wasn’t given full reigns to really explore the character back in the late 1980s. In fact, Craig is so good I don’t know how the franchise will replace him. As mentioned earlier, the film also includes one of the most exhilarating and imaginative fight sequences in a building construction site in Madagascar enhanced by the Parkour stunts performed by Sébastien Foucan. The only fight scene that matches it in excitement and sheer audacity is Bond’s battle with henchman Necros while the two are suspended out the back of a Hercules transport speeding over the Afghan desert in The Living Daylights. The depth of character dramatically improved with Craig’s Bond series. Eva Green’s depiction of Vesper Lynd is perfect and she is the most engaging Bond woman the series has produced. It was a pity that the sinister Quantum organisation that appeared in Casino Royale and the sequel, Quantum of Solace, was dropped in Skyfall. But it looks like Quantum will return in a new guise in 2015’s SPECTRE, with Jesper Christensen returning as Mr. White. 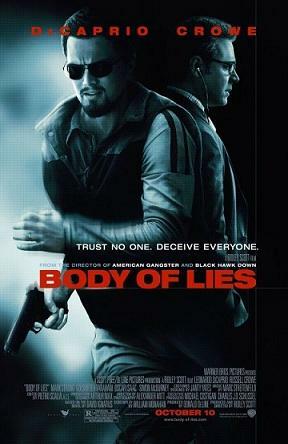 Body of Lies (2008) Ridley Scott has made many impressive movies (Aliens and Blade Runner are my favourites), but I missed Body of Lies when it was first released, and discovered this is one of his best movies. The film centres on three main characters: Leonardo DiCaprio is Roger Ferris, a CIA agent hunting a high profile extremist terrorist in the Middle East; Russell Crowe as Ed Hoffman, a ‘couldn’t care less’ CIA handler; and Mark Strong as Hani Salaam, the enigmatic head of Jordanian General Intelligence Directorate. The movie plays well on traditional spying methods mixed and the story that balances action and emotions. The interesting elements are the contrast between Middle Eastern and American cultures, and the high tech surveillance machine of the CIA compared to the human messenger, low tech and isolated-cell structure of the Islamic terrorists. While many American films and television series concerning terrorists are focused on the domestic (U.S.) elements of the conflict, Body of Lies takes us into the countries where these terrorists originate such as Iraq, Jordan and Syria. This film shows us how they live over there, giving us an insight into why extremism can fester in such countries. I had read that this film didn’t do too well on a financial front, but I suspect that was because the story was complex, not because of any failing in the movie. But reality is the Middle East is complex. Just read this article from the ABC to get an idea how deep the Middle East rabbit hole goes. I think this film did a commendable job at highlighting the complexities of the region. 2015 will see the release of Spooks: The Greater Good and SPECTRE, both of which I have high hopes for.